Ever have your dominoes fall into line perfectly? Or have you received something unexpectedly wonderful? This month had a couple of downs, but this week a couple of ups literally threw us “into the black” ink of life. Because of the good news, I had wanted to delay writing my post which now is being split due to its size. My post’s title was inspired by the “Forrest Gump” movie, “Stupid is as stupid does.” I am the type of person who believes that it is up to ourselves to find our happiness instead of depending on other people to provide it. This belief stemmed from when I was working as an administrative associate and decided to re-enter working with computers — only instead of writing programs, I began repairing and configuring them. So whenever an opportunity appears, I have learned to seize it. Taking advantages of these opportunities run the gamut of visiting pals/family, exploring work-related items, and electing to utilize an offer. This week gave our little Ohana some fabulous opportunities which we could not resist. After learning I will not be able to participate in our next Norlandda KAL at The Fibre Co. next week due to not having the yarn, I discovered my needed carpal tunnel removal surgery repair could be done on the first day of the KAL and would be covered completely by our medical insurance. Even better was hearing the news that my hand would immediately be able for light usage, the incision would be no longer than 3/4’s of an inch, and that two weeks was the estimated time for my stitches to stay put. If you were around when the surgeon presented all of this information, you might have seen my little bunny heart dancing around the room. So even though the bad news of not being physically involved with the KAL saddened me, the opportunity to have a much-wanted surgery during that time is too good not to pass. Another event that happened was when I decided to sell a shawl to a friend who requested one for her yoga instructor. I realized that the Meddybemps Shawl I had knitted would benefit another instead of sitting in my china cabinet waiting for its future owner. 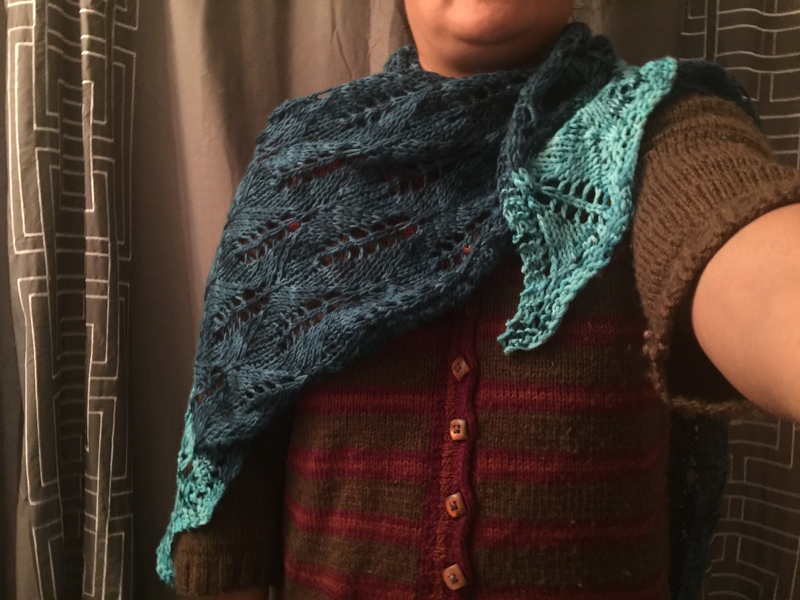 I contacted my friend April and sent her a couple of photos of the shawl. I do hope her yogini enjoys it!